A couple of weeks ago we were trying to think of desserts to serve at our fall party that were simple, but yummy. We’d served our Apple Crisp Pizza last year and felt like we should mix it up a bit. Baked apples seemed like a good choice. But we didn’t want to just fill them up with brown sugar and call it a day. So what better way to get the most apple-y apple dessert? Put apples inside the apples of course! Add some pumpkin spice, and bam! Super fall dessert. This recipe is super yummy, and really easy. It’ll impress your friends without stressing you out. And it’s great to serve at fall parties, though you could totally just make some for yourself if you want (which you probably will). Using a melon-baller, core and hollow out the 6 apples, making little cups. Place in a baking dish or on a baking sheet. In a small bowl combine the oatmeal, cinnamon, ginger, allspice, and brown sugar. Then stir in the butter and apples. Evenly distribute the mixture into the cavities of the hollowed apples. You may have some leftover depending on the size of your apples. Bake, uncovered, in the oven for 10-15 minutes until the apples are soft, but not mush. Let cool a bit, then eat and enjoy! You can eat these apples as is, or serve them with whipped cream, ice cream, or even caramel sauce. Posted on October 21, 2015, in Etcetera and tagged apple, dessert, easy, Fall, gluten-free, oatmeal, recipes, vegetarian, yummy. Bookmark the permalink. 4 Comments. Love baked apples! These sound really good! Mmmm these look so good! 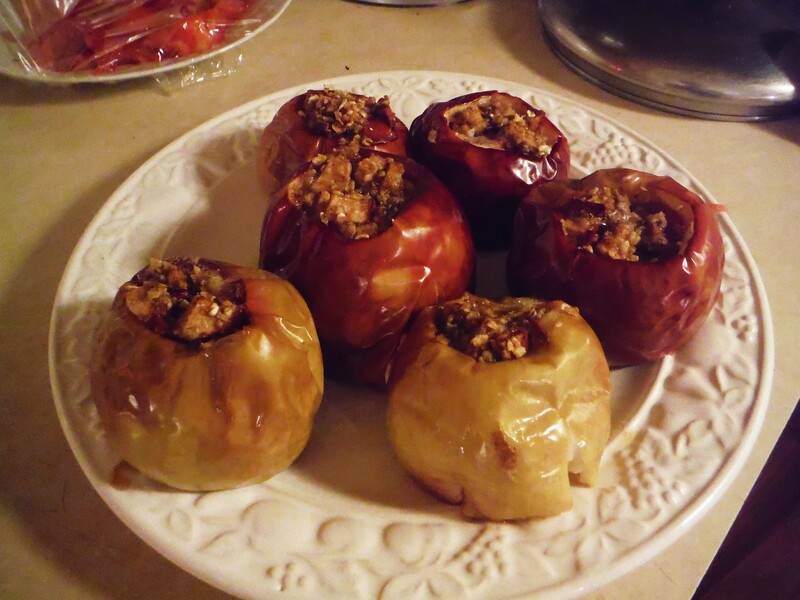 I’ve never had baked apples before but these might change that! BTW, I just discovered your blog and absolutely love it. Thank you for sharing such awesome recipes – I can’t wait to try them out! Go for it! They’re really yummy and easy to make. And thanks! It always makes us happy to hear from people who like our recipes. :) Let us know how they turn out! Absolutely! I am sure these are deeee-licious. I might “accidentally” get some chocolate chips and peanut butter in there though.